A NEW control and image processing software for temperature-controlled microscopy stages, called Link, has been released by Linkam Scientific Instruments. Link enables the control of allows various physical parameters for Linkam microscope stages, including temperature, humidity, shear mode, tensile force and vacuum. The software can be programmed with up to 100 ramps, so that complex experiments can be run. A new five-point calibration ensures accuracy and precision in data collection, says the company. With additional imaging module options, users can also see how their samples change in relation to a controlled manipulation. Link supports the Linkam T95 controllers with both USB2 and RS232 connections. Varying the environmental conditions can drastically change the physical properties of a sample. Proteins denature and polymers melt with heat, plastics tear under tensile force, and other materials may release volatiles, oxidise, or change colour or shape. Such visual changes can be analysed quickly and easily with the new imaging and extended measurements modules. Link can be programmed to take pictures at specified intervals, allowing area, distance, and angles to be measured and annotated directly onto the images. Other optional modules include TASC and 21CFR11. TASC is a new image analysis technique (thermal analysis by structural characterisation), developed in partnership with Professor Mike Reading of Cyversa, which tracks changes in surface structure. 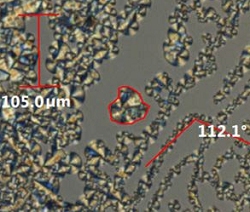 The technique is highly sensitive to glass and melt transitions and, unlike traditional DSC, it is possible to analyse different parts of the same sample to identify inhomogeneities. TASC can be combined with any Linkam thermal stage, in effect creating a modular thermal analysis system. 21CFR11 is the part of the US Food and Drug Administration (FDA) regulations on electronic records and electronic signatures (ERES). The 21CFR11 Module in Link software adds compliance by supporting access control, user level management, and audit trails of the data to guarantee the reliability of electronic records.